We are Volkswagen-certified and Volkswagen-approved, which means if you are leasing your vehicle and turn it in with body work done at our shop, it is okay! The dealer will not be able to charge you for substandard repairs. Of course, we hope you never need our services, but we also understand that accidents happen. At that time, let the Gunther collision center take care of you. Insurance companies cannot force you to take your vehicle to the facility of their choosing, so if you drive a Volkswagen, take advantage of our free local towing with collision repair and get your body work done here. You will not be disappointed. Our commitment to excellence is evidenced in the use of factory-finish paint, state-of-the-art equipment, and highly trained technicians with certifications by Volkswagen, ASE, and I-CAR. 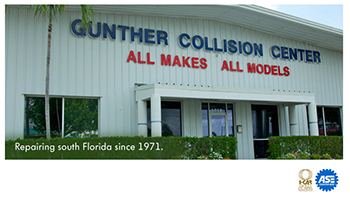 The Gunther Guarantee of Excellence is why we have been serving your South Florida auto body repair needs since 1969. It is important to us to have a body shop on-site at our Coconut Creek Volkswagen dealership, so that if your vehicle needs interior service work or parts, we have fantastic technicians on hand to serve you quickly while maintaining the utmost quality. Rest assured that the majority of repairs at Gunther are guaranteed for as long as you own your vehicle — your peace of mind matters! Why trust your vehicle to anyone else? As vehicles become more complex and computer systems control more of the drivability and safety systems of the vehicle, the challenge to repair your Volkswagen properly puts repair facilities at a decided disadvantaged to do a quality, safe repair to your Volkswagen. Dealers with an on-site body shop receive all the special tools and hundreds of hours of factory training to repair your Volkswagen back to factory specifications. This gives the dealer the advantage over repair facilities to perform a quality and safe repair to your Volkswagen. 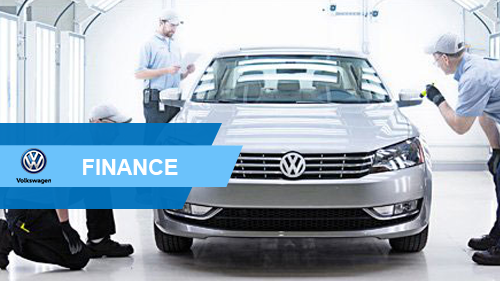 Our technicians work on Volkswagen models every day, rather than once or twice a year. They know your Volkswagen inside out. These advantages, along with the Gunther commitment to customer satisfaction, makes choosing the right place to repair your vehicle a simple one. Remember that insurance companies cannot force you to take your Volkswagen to the facility of their choosing. You have the right to have it repaired wherever you want. Gunther technicians are certified by Volkswagen, the National Institute for Automotive Service Excellence (ASE), and the Inter-Industry Conference on Auto Collision Repair (I-CAR). Our state-of-the-art bodyshop includes two car-o-liner drive-on frame racks, two state-of-the-art cartronic computerized measuring systems, and Pro Spot welding systems. If your Volkswagen is not drivable, we will tow it to our location for FREE prior to collision repairs. Please call Sal's Towing at 954-566-5166 with the location of your vehicle. This symbol assures you that our organization has achieved a high level of technical training in collision repair. You can be confident our staff understands the unique needs of your vehicle and has been trained on up-to-date repair technology. As a Gold Class Professionals designated business, we pledge to improve our knowledge of the repair process to better serve you as the customer.